Probably not the best title for a blog post but appropriate for today's subject. Generally speaking I prefer bright, sunny days, but can overcast and gloomy be as beautiful? I'm not sure but I set out to paint a gloomy day in this painting and see what happens. Sometimes you just have no choice, you have to take the weather Mother Nature hands you. Especially during autumn which is a fleeting season, you have to take every opportunity to get out and enjoy the color regardless. That what I did a few years ago when I made a weekend trip to Ogden Valley and explored the preserved nature areas surrounding the Pineview reservoir. It was a heavily overcast day, the sun never made an appearance but at least it didn't rain...much, I did get sprinkled on a bit. I took a lot of photos that day and yep, they all came out rather gloomy, including the one this painting is based on. One thing about overcast days is the lack of a strong light source tends to reduce the value range considerably, darks aren't as dark and lights are not as light so you end up with a middle key image, something to keep in mind while painting from a photo since the values will most likely be inaccurate in the photograph. I did increase the drama a bit from the photograph by making the sky more interesting. In the photo the sky is just kind of a flat, purplish gray, a common problem for amateur photographers like me. While I generally prefer to paint sunny days this gloomy day painting was an interesting exercise. Also unusual for me was the use of oil paint, my paintings tend more towards grayness when painting with oils for some reason anyway, so quite appropriate for this painting. Seems like I can't leave well enough alone, I'm always experimenting, especially the last year or so. However my typical go-to techniques have been either lots of layering using brushes and glazing or thick palette knife application. Last month I made two paintings using a somewhat different technique/style. "Spring Walk in the Mountains"
As you can see in this painting the entire image is made up of small, square brush strokes creating a sort of mosaic effect. I'm not sure this could technically be called impressionism but the image is more abstract the closer you look at it so it does have an impressionistic visual effect. The technique is very simple and I think that is one of the things that appeals to me. I did a simple underpainting to establish the composition then simply applied deliberate brushstrokes. 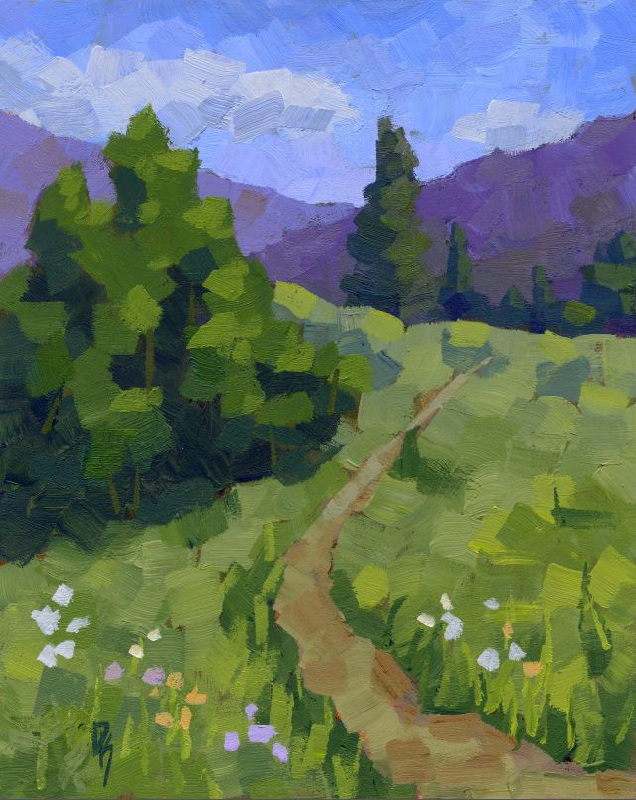 The idea is to always consider the brushstroke color, direction and placement before putting it down, it forces you to slow down and by more mindful. My goal was to avoid having to rework my brushstrokes. There is some overlapping of strokes but nothing to the extent that could be called layering. One of the challenging aspects of using this technique with this image is that I was using square brushstrokes to represent the organic shapes of clouds, distant mountains and trees without it looking mechanical, I think it worked out pretty well. 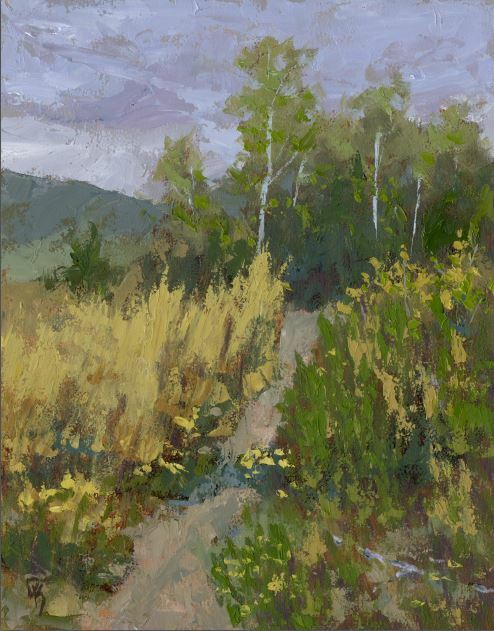 The painting is based on one of the many photos I've taken while hiking in the Wasatch Mountains, I think I was on the Willow Heights Conservation area trail for this one. 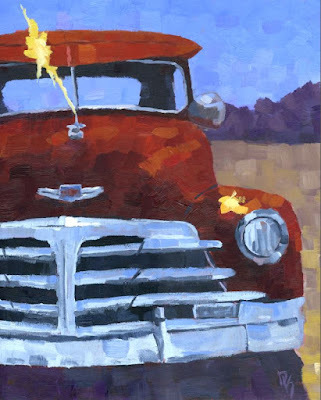 Acrylic on 3/4" panel, 20" X 16"
This second painting was an experiment of trying the "little squares" technique on a vehicle. To keep it simple I chose a close crop of a 1948 Chevy that I photographed at a car show and I put in a simple abstract background. While I did have to stray slightly from the "little squares" concept in order to maintain the identity of the car it was easier than I thought it would be to keep the variety of shapes on a classic car identifiable, and it was a lot of fun and went quicker than I expected. I think there is plenty of potential in the "little squares" technique/style, the process was enjoyable and produced interesting and effective results, I'm sure I'll continue to explore this concept.